It's Superbad meets Spacebars in this hilarious extraterrestrial road trip! Just a few days before prom, Bennett pulls off something he never imagined possible: his dream girl, Sophie, agrees to be his date. Moments afterward, however, he watches Sophie get updated by aliens in the middle of the New Mexico desert. 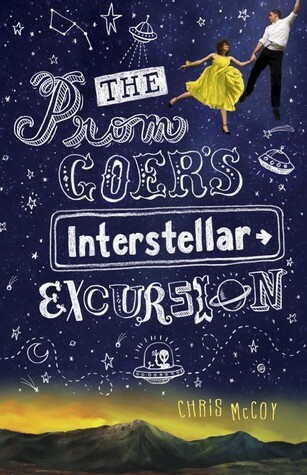 Can he navigate alien concert venues, an extraterrestrial reality show, and the band's outlandish egos to rescue his date in time for the big dance? I. LOVED. THIS. BOOK. It caught my eye while roaming around in Barnes and Noble one night waiting impatiently to get a seat at the Cheesecake Factory for 1/2 off cheesecake day. Aliens? Sold. Fun font on the cover? More sold. Little human figures floating in the stars? A bonus. Bennett has been in love with Sophie for like, forever, despite the fact that he's pretty sure she has no idea he even exists. While gazing through his telescope one night, and totally not stalking her, Bennett sees Sophie crying in her driveway, so gallant lad that he is, he treks on over to her house to see if she is okay. A short conversation about Sophie's "sad" breakup leads to a road trip to Roswell to get her motorcycle fixed. The New Mexico desert is a dangerous place, and while enjoying the evening together, Sophie is abducted by aliens, leaving Bennett in quite the predicament. 1) Stupid aliens just stole his dream girl and new prom date. 2) Said dream girl and prom date was now a missing person. 3) Bennett was the last person to see her alive, thus the lead suspect in the disappearance of Gordo, New Mexico's Ivy League to-be student. So Bennett decides that he only has one option. Get himself abducted so he can save his lady love. The description compares this to Superbad and Spaceballs. I totally disagree. It's more a mashup of The Hitchhiker's Guide to the Galaxy and Spinal Tap. McCoy uses long rambling sentences (which I adore) and quick snappy dialogue to bring this strange a kooky universe to life. Bennett and Sophie's saviors come in the form of a dysfunctional rock band known as "Perfectly Reasonable." The lead singer is a diva of an alien who likes to wear tight close and be all self-righteous about his music. The two other members of the band include a womanizing human that has been in space too long and an alien who plays the drums but dreams of starting his own fashion line. Genius. The story is quick, hilarious, and amazingly adventurous. Do you remember yesterday when I said that I'm over teen books to movies...well this is an exception. I REALLY want to see this on the silver screen!